You know your restaurant is probably your greatest asset. 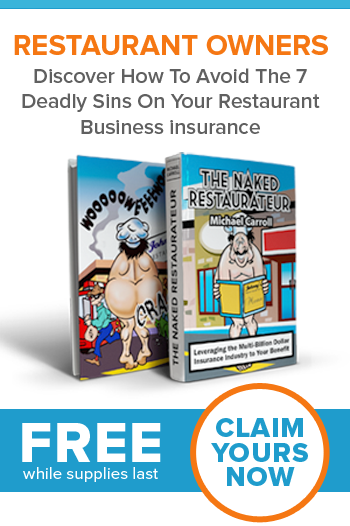 But did you know your restaurant could also be a deadly liability? Did you know that it could cost you more money than you have right now? This story may explain what I mean. Please read on. Tony owned a restaurant in the Philadelphia area. He’d been in business for over ten years and had built up a substantial clientele. On this particular morning as usual he was the first to arrive. That was the story of Tony’s life: first to arrive, last to leave. He often joked that the only difference between owning a restaurant business and having a job was the tyrant he worked for: himself. Tony loved his restaurant. He loved this business. It was, after all, the American Dream. In his mind, it was worth all of the sacrifices. As he walked toward the restaurant, he picked up litter outside the door. He was stickler about keeping the place neat as a pin. Opening the door was always a comfort to him. Rather like coming home. He stuck the key in the lock but it didn’t feel right. It was already unlocked. Had someone else arrived first? There were no other cars. He pushed the door open and his heart sank. A quick scan of the premises told him this was going to be bad. Every drawer of every register was open. File cabinets were open. One was knocked over. Did they find the key? He ran to his desk. Sure enough, they had found the key to the cash drawers. Did they take checks? How much cash had he left lying around? His mind started to race. Who could do this sort of thing? Then he saw that his leather chair had been slashed! His heart started pounding with anger—or was it fear? He couldn’t be sure. If they’d slashed his chair, that meant they’d done more than rip off money. They’d vandalized. He knew it wouldn’t do much good, but it was time to call the cops. As he sat there waiting for the police, his mind started to race. What other kinds of damage did they do? What else could go wrong? When was the last time he’d conducted a full inventory? And what about the accounting records? Could these punks—or whoever did this—have damaged the computers? What about the van? Was it still out back? Had he left spare keys in the office? Would all the locks have to be changed out? Tony wandered back to the supply room. “Holy smokes!” he moaned. “Look at how much they took!” What would he tell his customers that day? How long would it take to get back to business? What would he tell his employees? His main supplier had a backlog of four days! Would he have to wait almost a week and miss a weekend before he was fully up and running? As the cold, hard facts began to settle in on him, Tony realized this could mean the end of his business. His thoughts then turned to his insurance agent. He’d never paid much attention to that policy. Always figured nothing would really go wrong. Now he really felt panicky. What was covered? What wasn’t? How would he pay the bills while business was down? Would he have to lay people off? At the end of their tour Tony looked at Jim expectantly. “Well?” he said. Tony could tell by the look on Jim’s face there was something wrong. Jim’s eyes darted around the room. “Tony, I’m afraid we might have some problems.” What problems could Tony possibly have had? After all, all insurance policies cover theft, right? True, theft was covered but it was the small print and the small details that were missing. Computers and other office machines weren’t covered. Restoration of damaged property. Spoilage wasn’t covered. Various limitation in the policy meant that items besides cash that were actually stolen had limited or no coverage at all. As it turns out, Tony wasn’t as prepared for this unfortunate event as he had thought. As a result, Jim was no longer Tony’s insurance agent. Tony was crushed. This restaurant was his life. It represented his security and his freedom. Someday it was to be his retirement. And now this. Can you relate? I’m here to say, “It doesn’t have to be this way!” You can have the dreams you cherish. You can count on the security you desire. You don’t have to worry every day about something happening that’s going to set you back. We know it’s not just vandalism or theft. Heck, a lot goes wrong around a restaurant just because that’s the way it is. It’s the nature of business. Let’s say a fire starts in the business next door. Your restaurant suffers smoke damage, plus your sprinklers went off. Who’s responsible? Are you covered? Who pays your fixed bills? Who pays your electricity, phone, water? Do you have enough cash flow to survive? Or will you go out of business—for something that was completely out of your control? It doesn’t seem fair, does it, but I’ve seen good people suffer needlessly because they didn’t know the secrets of how to make the huge resources of the insurance industry work for them. I’ve been working with restaurant owners for a long time and I’ve heard every horror story in the book. If Tony had been my client, his problem would have been taken care of quickly and easily. Many times restaurant owners like Tony have become my clients after they had a really serious claim. They wished they’d had me—a restaurant insurance specialist—as their agent before the claim.